The Eastfield women’s soccer team kicked off the season by winning two of its first three games. The Harvesters scored nine goals and conceded only two while recording two clean sheets. 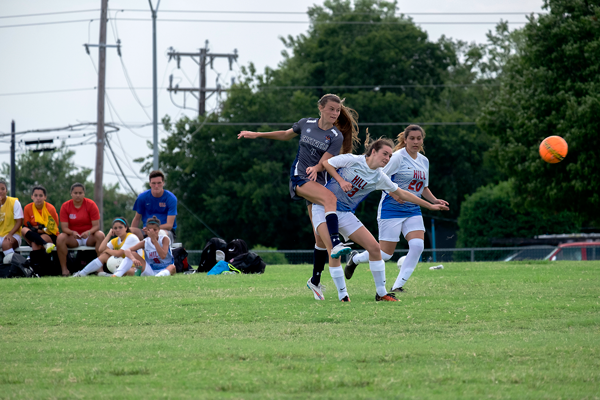 Eastfield scored twice in quick succession early in the second half and later added two more goals to pull away for a season-opening road win on Aug. 22. Freshman forward Arianna Dunsworth opened the scoring for the Harvesters in the 40th minute as they took a 1-0 advantage into the break. Freshman forward Mirella Hernandez scored the Harvesters’ second goal of the day, while Joy Carlock grabbed the third. Freshman forward Angela Lomeli notched the fourth after 70 minutes, and defender Odalis Bernabe closed out the scoring with four minutes left. Sophomore attacking midfielder Emily Juarez assisted on Hernandez’s and Lomeli’s strikes, and she also created other scoring opportunities with two shots on goal. The Harvesters fell behind 1-0 in their home opener on Aug. 25 after Renaisha Mitchell’s strike in the 21st minute. However, in the 58th minute, Carlock set up Dunsworth for the equalizer. The score stayed tied until the closing minutes, with Hill’s Jerci Lopez scoring the game winner with just four minutes to go. Stein said the team made defensive errors on the goals conceded, and they must learn from those mistakes and prevent them in the future. Freshman defender Alexis Villa set up Dunsworth in the 35th minute for her third goal of the season, giving the Harvesters a first-half lead that they would never relinquish in an Aug. 29 shutout.Stein praised how his players reacted to the early substitutions he made, quickly turning the game in their favor. Eastfield scored two quick goals just after the 70-minute mark in the second half. Freshman midfielder Alyssa Guzman took part in both goals, assisting Lomeli for the second before being immediately being set up by Carlock for the third. Goalkeeper Gabriela Roa came up big for Eastfield, making eight key saves and preventing Cisco from getting onto the scoreboard. She admitted making some costly mistakes during the previous game, but vowed to continue to improve. Dunsworth is proving her worth to the team, having scored in each game she’s played, but she knows she needs to produce more for the team to succeed. Stein said he’s glad that the team’s depth is being challenged, as it gives each player the experience needed to compete at a higher level and gets them ready for the games that matter later in the season.